Comparing Xero vs. QuickBooks Online: what’s the best cloud accounting tool for your business? A cloud accounting tool can be one of the most powerful contributors to the day-to-day running of your company. With a system like Xero or QuickBooks Online, you can enjoy a crystal-clear view of your accounting, stay on top of projects and time tracking, and maximize tax deductions. In terms of the accounting features that most businesses need, Xero and QuickBooks Online are both comprehensive tools that are likely to tick your boxes. But their approaches are different, and they each have different strengths. Xero was founded in 2006 in New Zealand and has since consolidated its reputation as one of the top accounting tools on the market. Its tagline is “Beautiful business”, which is the main thing you need to know about Xero: it manages to make accounting sleek and enjoyable. Xero is incredibly user-friendly, simple and powerful, and is designed to help their customers do better in their own businesses via their accounting tools. QuickBooks Online, the market-leading accounting software from Intuit, offers “Smarter business tools for the world’s hardest workers”. With their cloud-based system, businesses can automate much of their repetitive tasks and processes by tracking projects, managing bills, and even tracking miles automatically with a smartphone. What’s the difference between QuickBooks and QuickBooks Online? QuickBooks is Intuit’s general accounting software, while QuickBooks Online (QBO) is specifically the cloud-based service. For QBO, you pay a monthly subscription rather than an upfront fee, and you get all the patches and software updates from Intuit. In this article, we’ll mostly refer to QuickBooks Online (which is what we think you’ll likely opt for instead of Intuit’s desktop version of QuickBooks). Both Xero and QuickBooks Online are optimized for small to mid-sized businesses, so large enterprises with more complex requirements may struggle to tick all of their boxes. But for most businesses, agencies, retail stores, and startups, there’s a lot to love about Xero and QuickBooks. Here’s our verdict, alongside a comparison of cost, feature sets, accountant preferences, reporting, ease of use, integrations, and user reviews. Xero’s most basic plan (Early) comes at $9/month, but you’re very limited with the feature set. You can only send 5 invoices and quotes, enter 5 bills, and reconcile 2 bank transactions. For most businesses this isn’t going to be enough. Their mid-price plan (Growing) will fit most small businesses. You can send invoices and quotes, enter bills, and reconcile bank transactions for $30/month. For the full feature set, you’ll need Xero’s top plan (Established). For $60/month you get all of the Growing plan plus multi-currency functionality, expenses (to capture and manage claims), and projects (to track project time and costs). If you want access to their Gusto full-service payroll (available across all 50 states for U.S. customers), pricing starts at $39/month base + $6/month per person. QBO’s basic plan (Simple Start) comes at $20/month. This comes with much more functionality than Xero’s cheapest plan, including all the basics of tracking income and expenses, capturing and organizing receipts, invoicing and accepting payments. You also get access to basic reporting. The main limitation of QBO’s Simple Start plan is access for only one user. You also can’t track time and manage bills. Most businesses will go for the Essentials plan at $35/month, with all of the above features plus up to 3 users, time tracking, and access to manage bills. As with other cloud accounting systems, the fancy features come in the top plan: Plus for $60/month. You can track inventory, manage up to 1099 contractors, and enjoy QBO’s newest feature, tracking project profitability. All plans give you access to the following add-ons for 50% off: self service payroll ($35/month + $4/employee/month), or full service payroll ($80/month + $4/employee/month). All plans also include receipt capture, expert support, and out-of-the-box integrations. If you need to track income, expenses, invoices and time, you’ll likely be paying $35/month for QBO or $60/month for Xero. For the top plans (both $60), you’ll get similar functionality from both providers. Xero and QuickBooks Online have very similar feature sets. With either tool you’ll get reliable features for processing invoices and quotes, reconciling fast, managing inventory, sending purchase orders, and managing bills and expenses. You’ll also get a mobile app to manage your business on the road, plus integrations with your other favorite business tools. Xero is a dream for small and medium-sized businesses in need of a user-friendly approach to their bookkeeping. It’s the most intuitive and easy-to-use accounting system. However, for more complex features like full stock management or control, you may need integrations with other tools to tick all your boxes. Both Xero and QuickBooks Online offer inventory management functionality, but QBO has the edge here. QuickBooks also offers the most comprehensive point-of-sale solution. With QuickBooks, it’s incredibly easy to connect your bank account – the feature at the foundation of your bookkeeping. There is a tiny amount more friction from Xero, and the bank feed connection is slightly less seamless than with QBO. Our verdict: QuickBooks Online has the most comprehensive feature set, but it’s a close call. When choosing the best accounting tool for your business, don’t overlook the importance of integration. Your accounting system is one of your core tools, and for maximum results you should integrate with your other systems. Your CRM system (such as Salesforce and Xero, or HubSpot and QuickBooks). Your time tracking tool (like Harvest) if you use a separate app. E-Commerce (such as Shopify and Xero, or Shopify and Quickbooks ). Other tools offering more complex accounting add-ons, such as point-of-sale functionality, inventory management, and debtor tracking. Xero and QuickBooks both offer a good number of integrations in their respective marketplaces. When it comes to syncing your contacts between two tools – such as with your CRM – PieSync offers an easy solution to keep everything in order. There are connections between hundreds of tools, so you’ll likely find a solution to your integration needs here. 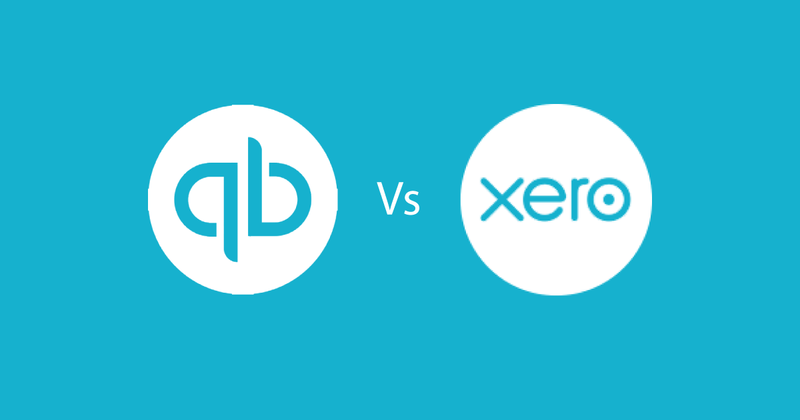 Our verdict: it’s a draw between Xero and QuickBooks for integrations. When it comes to pulling reports based on date range, such as monthly P&L and balance sheets, QuickBooks Online makes it a breeze. Xero is a little more clumsy here. QBO has the advantage of more time on the market to evolve to their customers’ precise needs and user flows. However, while QuickBooks has a good range of standard reports, it lacks some customization compared to Xero. 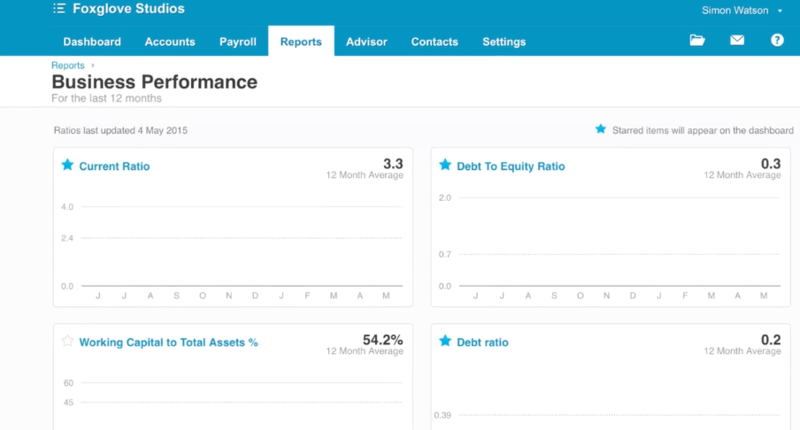 One of the strengths of Xero is its Business Performance dashboard that highlights all of your most important metrics – such as debt ratio and gross profit percentage – in an easy-to-digest view. For companies that need more than the standard Xero and QBO reporting can offer, they can make use of add-ons and integrations. There’s a reason why startups generally prefer Xero than QuickBooks Online: it looks better. It feels more modern and more user-friendly. Most users will find Xero more enjoyable to use. That matters more to some than others, but if you want to look forward to using your cloud accounting system, give Xero a spin first. As a recent 5/5 review of Xero shares, “Xero makes reconciling fun” – it sounds cliche, but we believe them. Back in the early 2010s, QuickBooks Online was criticized for its old-looking user interface. Things have changed since then, however, and competitors like Xero have pushed QBO to rethink their user-experience. But it still has room to improve here. Our verdict: Xero is our clear winner on user experience. According to some reviews on Capterra, the bigger your business and the more complex your businesses, the more Xero will struggle to fit all of your needs. However, Accounts & Legal Consultants shared how Xero successfully managed the accounting for one of their large clients with 50 stores in the UK. Xero told them that the soft limits for transaction volume are around 2000 sales, 2000 purchases and 4000 bank lines per month, after which Xero’s performance “deteriorates dramatically”. If you are under these numbers or can use workarounds like Accounts & Legal did in the case above, Xero should still be a good fit for your growing business. 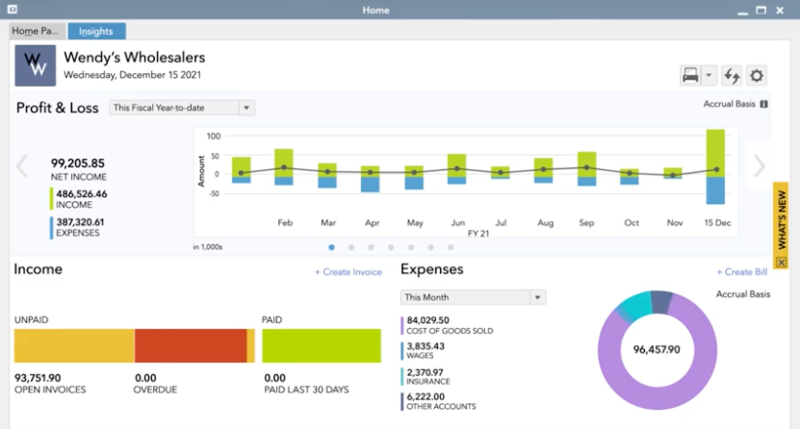 As a larger business or one that’s fast scaling, look into Intuit’s wider software suite, including QuickBooks Enterprise Solutions. QuickBooks Enterprise is designed for the needs of larger businesses, claiming to have 6x the capacity of other QuickBooks editions. The Enterprise edition scales up to 30 users, supports up to 1 million list items, and offers advanced reporting, inventory and printing. Our verdict: QuickBooks for larger businesses or those scaling fast. If your accounting becomes time-consuming and complex, or you’re lacking business transparency and access to vital data (like cash forecast and sales margins), look for accounting software that’s designed for larger businesses. In terms of initial set up, QuickBooks offers a few options for importing Excel sheets, but Xero allows you to import just about anything via Excel templates. You can download these from Xero, get your data into the right format, and upload it. Xero also has instructions for easily converting from QuickBooks to Xero. When looking at customer support, both Xero and QuickBooks Online have room to improve. In the last year, Xero has had some complaints about its customer support in reviews on platforms like Capterra. Pressure will be put on Xero to step up its support and best compete against players like QuickBooks Online. As of the time of writing, both Xero and QuickBooks Online are rated 4/5 for customer service on Capterra and 3.9/5 on GetApp. Our verdict: Xero wins on set up and ease of use. Both have room to improve their customer support. Xero: well-known and used by accountants outside the U.S.
Accountants praise Xero’s automatic bank feeds, usability, and simplified payroll. When it comes to doing your tax return at the end of the year, they have everything they need to get going. It’s also easy for accountants to fix user errors in Xero, and there are built-in proper audit trails and safety checks. As of 2017, you can also produce GAAP-compliant Statement of Cash Flows for your client reporting needs using Xero’s single integrated reporting solution. If you’re based in the U.S., your accountant’s main complaint might be lack of experience with Xero. QuickBooks is the market leader in the U.S., so they will likely be used to working with that. Xero is more common outside of the U.S., and U.K. and New Zealand accountants in particular will likely recommend it. QuickBooks has been GAAP and IAS compliant for longer than Xero, and has been the preferred choice of many accountants for some time. It’s also the market leader in several regions. All in all, it’s unlikely that your accountant will have any issues with working with QuickBooks. Our verdict: It’s a draw. Both Xero and QuickBooks are popular and well-loved. The winner for your accountant is likely to be down to your location more than anything else. QuickBooks Online is rated 4 out of 5 on Capterra by 2808 users, while Xero has an average of 4.5 from 1570 users. QuickBooks claim on their website that 98% of customers say that their solution helps them run their business more easily, and we can see why: there’s a reason that QBO has built such a solid reputation. QuickBooks Online has been in the market for longer than Xero, is very well-developed, and is generally loved by accountants - especially in the U.S. market, which QBO have dominated. In 2015, QBO had an estimated 80% market share. QBO claim that customers find on average $3,534 in tax savings per year. Xero has a strong value proposition to compete with QuickBooks Online: its customers love it. Xero consistently gets stronger average reviews then QBO despite a lower quantity of them. With its younger brand image and focus on clean usability, Xero is also much more popular in the startup world than QuickBooks. Our verdict: Although QuickBooks Online has the biggest market share, Xero wins on customer review sentiment and gets our vote. For small businesses: Xero, for its easy-to-use and sleek interface. For freelancers: QuickBooks Online, as it gives the most value at the lowest price point. However, look into other tools that are designed specifically for freelancers, such as FreshBooks, AND CO, or Cushion App. These have in-built time tracking functionality at a lower price point, alongside other handy features that freelancers will use on a regular basis. For retail stores: QuickBooks Online, for their point-of-sale functionality and inventory management. For growing startups: Xero, for its user experience. For established businesses: It’s a draw. QuickBooks has the most reliable and comprehensive feature set, and is less likely to have barriers to scaling. However, Xero is the most user-friendly.